My Latest on Catholic Mom.com - and an upcoming interview! 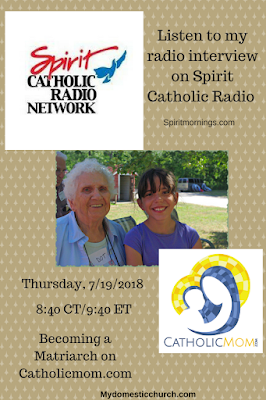 I will be interviewed about it on Spirit Catholic Radio on Thursday Morning 8:40 Central/ 9:40 Eastern time! I'm super excited about it! You can listen on the app. Or listen after the fact in the archives! My Aunt Dorothy is the current matriarch of our huge family tree. At 99, she is the oldest surviving aunt of a family with 10 main branches representing four generations and hundreds of offspring. This past year Aunt Dot’s robust health has declined somewhat. She lost her ability to walk and her eyesight is failing, but she is mentally sharp and she still has that great sense of humor. She is my late grandfather’s youngest sister. By most summations, she would not count as a “close” family member. Yet she is very dear to me. So precious that for most of my life, I have put in the effort every summer to travel to upper Michigan to see her. We have also exchanged letters until this past year. I’m not alone. Many of my older cousins and their children drop in on Aunt Dot and have stories to share about her. I’ve been thinking a lot about her this summer. What did this woman in her tenth decade of life do to gain so much admiration from all over the family tree? Why do people travel from all over the United States every summer for a family reunion specifically to see her? Simply put: she cared, and she let people know that she cared.